Induction heating can be used to produce wind turbines with reduced maintenance and maximum uptime. In today’s global economy, manufacturers of power generation equipment face many challenges. While continually seeking ways to drive down production costs and accelerate time-to-market, improved product quality and manufacturing consistency are absolutely essential. And particularly in the power generation industry, environmental concerns have begun to play a major role. 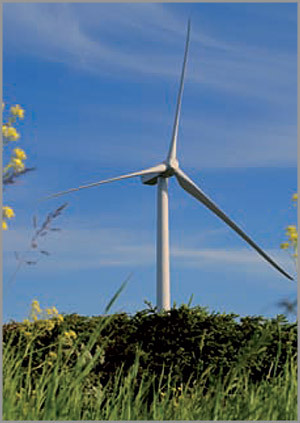 As the global demand for clean energy increases, wind turbine machines have become increasingly popular because of their relatively small carbon footprint. Designed to produce electricity from the kinetic power of the wind, they produce large amounts of electricity when grouped together in onshore or offshore windfarms. The production of gear boxes for wind turbines requires a series of paintstaking and expensive manufacturing processes to ensure that the parts have the required quality, strength and durability. Industrial heat treating and hardening sytems from GH Induction Atmospheres can greatly simplify the manufacturing process for slewing rings as well as yaw, pitch and rotor bearings. With precise accuracy and control, GH IA systems can selectively harden specific areas of the gear, producing parts with superior strength and wear resistance. It has become much more economical to repair costly industrial gas turbine engine components than to replace them. Our turnkey induction heating systems provide cost effective, time-saving solutions for repairing high pressure turbine (HPT) blade tips, Ti weld stress relief, brazing metering plates to dovetails and wear pads to mid-span spars, brazing honeycomb seals and other engine components, handling orphan parts and many other applications. Worn HTP blade tips can be repaired for reuse with a specialized welding process. Induction heating is a cost-effective way to bring the blade tip up to welding temperature (typically1800°F) in just minutes. Induction heating is widely used to produce wind turbines. 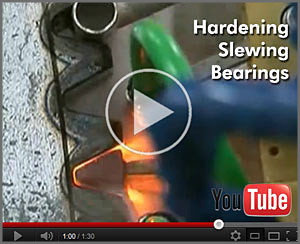 Watch our YouTube video "Hardening Slewing Bearings."